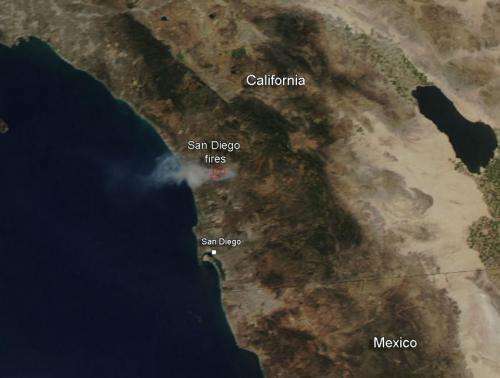 Seven fires are still burning in San Diego County, California. Arson is suspected as the origin of these fires. Two teens have been arrested on suspicion of setting the fire that spread so ferociously across the county. All of California is experiencing exceptional, extreme or severe drought conditions. The wildfire area is in the second-most dangerous category--extreme drought conditions. California's governor has cited climate change as a factor in the fires, noting the last three years have been the driest in recorded history. Wildfire season used to start in late summer and extend into the fall, now it appears that threat continues year round due to the conditions that California is currently facing. Credit: NASA image courtesy Jeff Schmaltz LANCE/EOSDIS MODIS Rapid Response Team, GSFC. Seven fires are still burning in San Diego County, California. Arson is suspected as the origin of these fires. Two teens have been arrested on suspicion of setting the fire that spread so ferociously across the county. All of California is experiencing exceptional, extreme or severe drought conditions. The wildfire area is in the second-most dangerous category—extreme drought conditions. California's governor has cited climate change as a factor in the fires, noting the last three years have been the driest in recorded history. Wildfire season used to start in late summer and extend into the fall, now it appears that threat continues year round due to the conditions that California is currently facing. NASA's Aqua satellite collected this natural-color image with the Moderate Resolution Imaging Spectroradiometer, MODIS, instrument on May 15, 2014. Actively burning areas, detected by MODIS's thermal bands, are outlined in red.